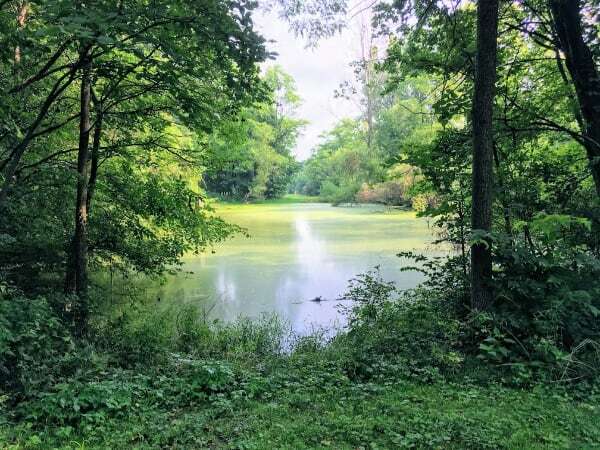 We have lived 30 minutes from the Mississinewa Lake campground for over 16 years and yet have not camped there until this past summer. Now that we have we are wondering why we waited so long. We only had a two-night time slot available for camping this past August so we wanted to go somewhere close by. I wanted to camp at state park we had yet to camp at, leaving us two close by options: Ouabache and Mississinewa. 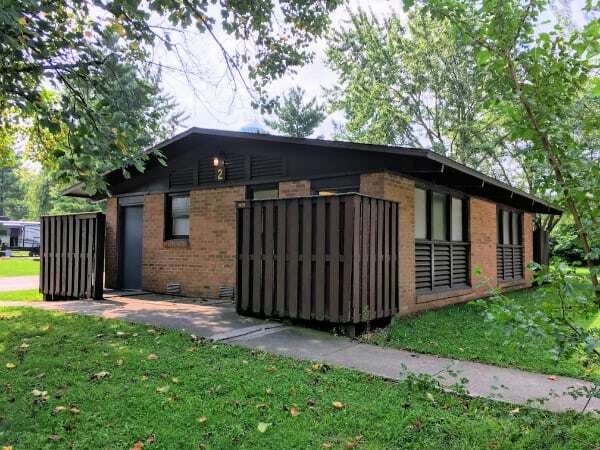 We decided on Mississinewa and booked a spot for Friday and Saturday evening. We arrived Friday evening after dinner. We picked out spot 102 online since it was on the outer border of the park, meaning we wouldn’t have as many neighbors. It was relatively level and long enough for our 27 foot Jayco, but we were disappointed with one thing. However, that one thing was entirely my fault. 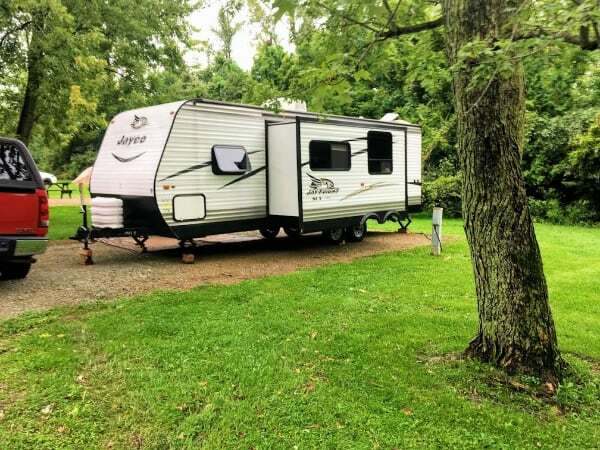 You see at every other State park we have camped at in Indiana there have not been full hookups (full hookups means you have access to water, sewer, and electric at your site) however, at Mississinewa most sites do have full hookups. I emphasized most in the last sentence because it turns out the outer row of the campsite does not, and we had a site on the outer row. We still had power, but not sewer or water. 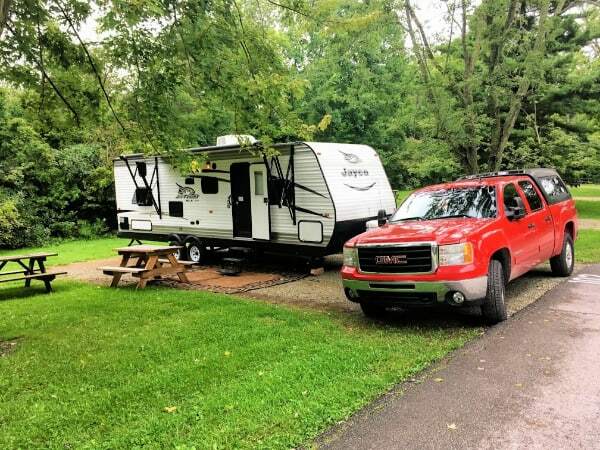 I didn’t even think to look for full hookup sites when I booked because as I said–all the state parks we have camped at in Indiana haven’t had a single spot in their park with them. It wasn’t a big deal since we are used to filling up our water tanks before we park and we were not staying long enough for us to have to go through the effort of refilling them anyways. Had I known we could have grabbed a full-hookup spot and avoided having to spend the time and effort to dump our tanks at the end of our short camping trip, I would have grabbed a full hookup site. 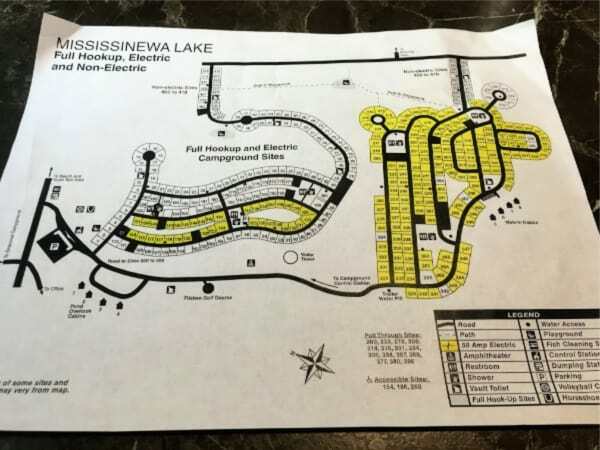 Lesson learned: always read the campground amenities list before you book your campsite because what you assume might be wrong. My husband and I tend to use our travel trailer’s plumbing for just two things–dishes and, well, number 1. We do shower in it occasionally if we have full hookups or the showers at the campground aren’t that great. but never do we go number 2 in the toilet. My husband created this rule years ago when we bought our first travel trailer with a bathroom. I don’t blame him, the idea of dealing with that if you don’t have to isn’t pleasant. 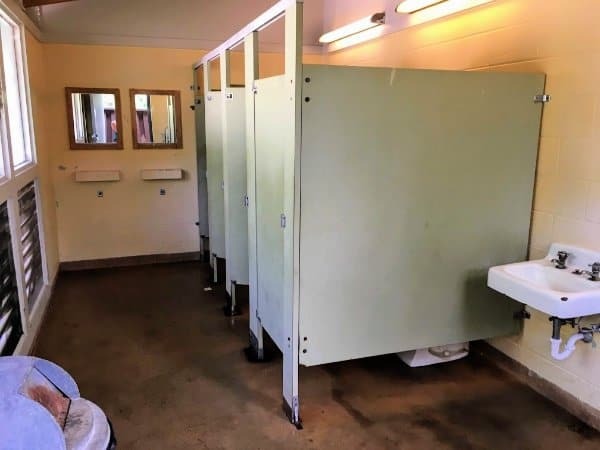 Anyways that said, the state of the campground bathrooms is always important to me so in 95 % of our campground reviews you will see pictures of the bathrooms. 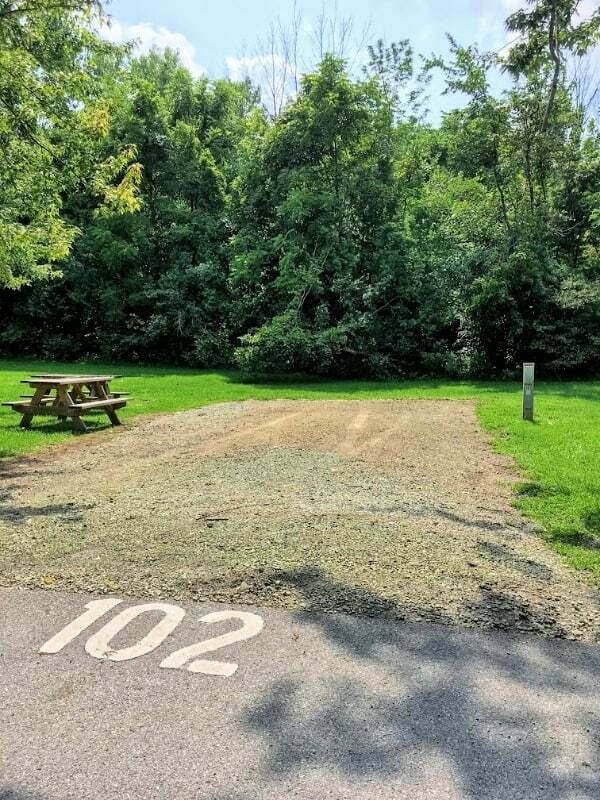 Those at the Mississinewa campground were clean, but seriously outdated. The showers were lukewarm, so after one not so hot shower, we decided to shower in our trailer instead–since we were not staying long our tanks held enough water for us to do this. Saturday during our stay was rainy so we enjoyed a relaxing morning inside our travel trailer reading, and playing our two favorite camping games, UNO and travel Yahtzee. 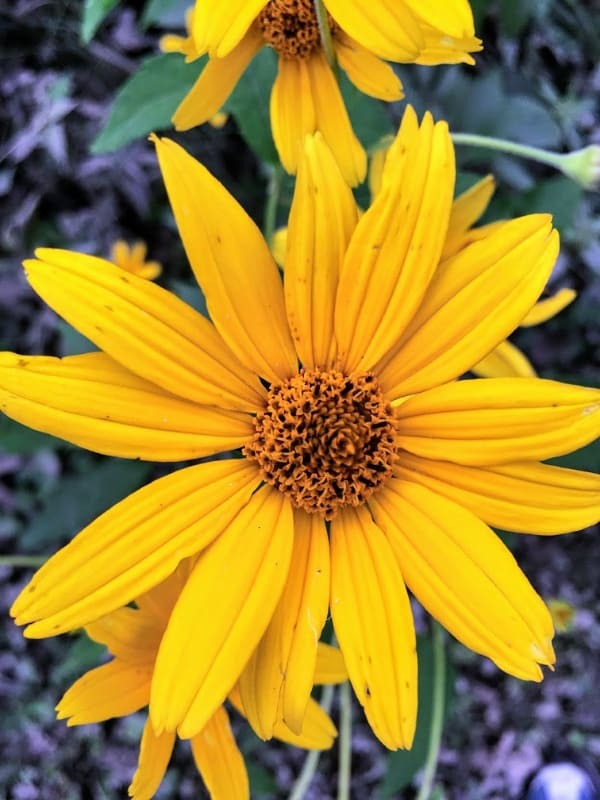 Sunday was rain-free, but very humid. We fought through the discomfort that high humidity brought and managed to hike two trails in the morning hours. 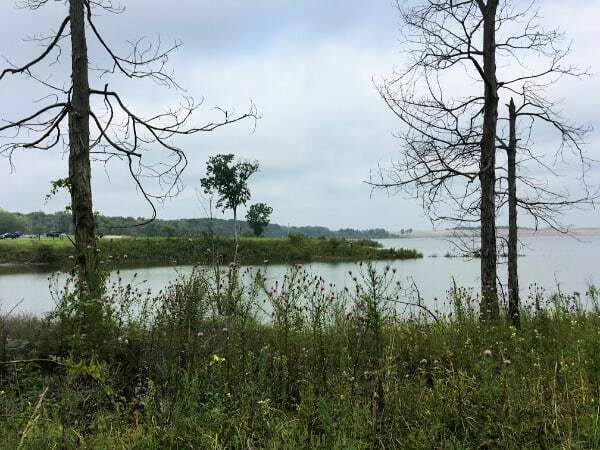 First, we hiked the 2.5 mile Blue Heron trail where we enjoyed various varieties of wildflowers and views of Mississinewa lake. We did almost take a wrong turn about 3/4 of the way through the path since there were no markers to direct us as to which side of the fork in the trail led us to either a quick exit to the parking lot or the lake views. 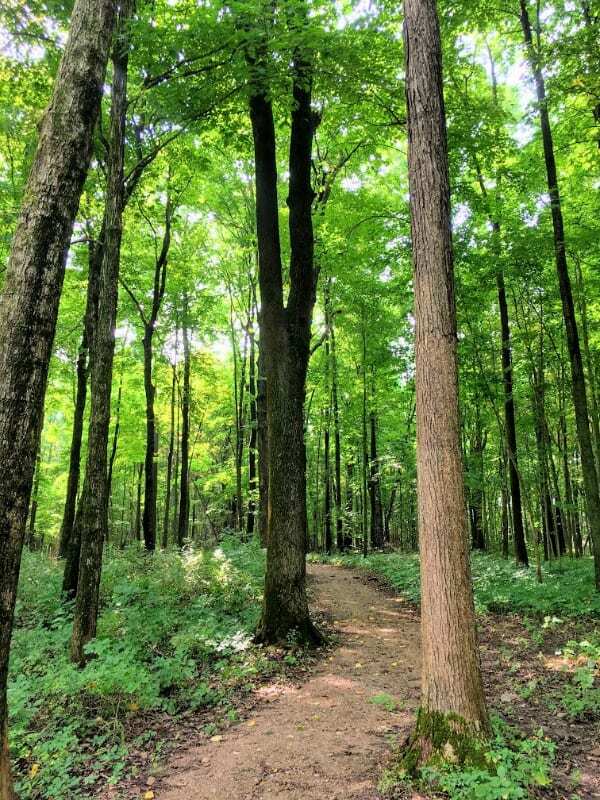 Poorly marked trails is a common problem for us when hiking in Indiana, even with a trail map there are often side trails that are not on the map that make deciding which path is the real trail challenging. My husband often teases that in his retirement he is going to make it his project to build and place good trail markers on all Indiana trails. 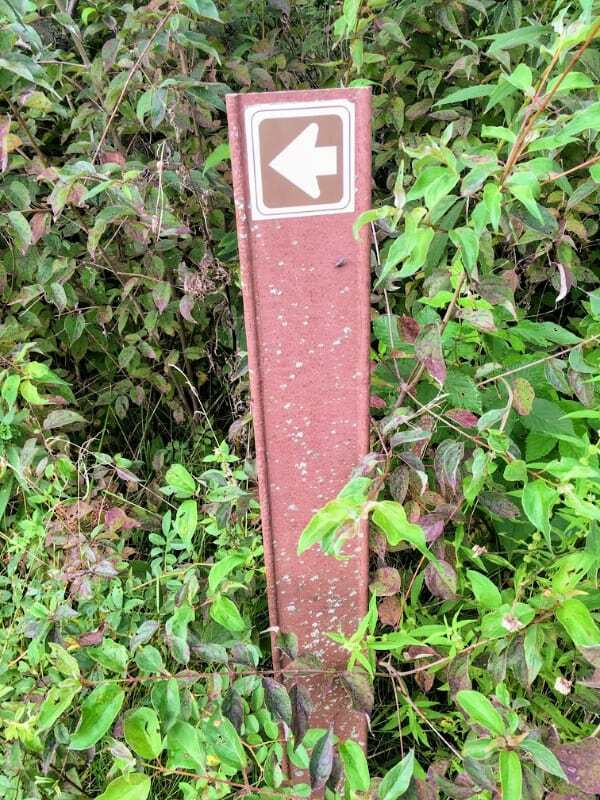 For instance, we found this trail marker on the Moswa trail around the bend of the path just after the trail had split. It would have been much more helpful had it before the trail split and not after. Oh, well. At least it confirmed our decision to take the path we did. The Moswa trail is 1.5 miles long and mostly wooded. You turn around at the pond to head back on the same path you used to hike to the pond. From the Moswa trail, you can see several disc golf baskets, including one that looked somewhat challenging. Take a look at the picture of the pond above. If you squint, you should be able to make out a disc basket on the other side of the pond. The tee off for that disc basket is where I stood to take that picture. Yep, you have to throw your disc over the pond. I wonder how many discs there are in that pond? We did bring our discs with us intending to play sometime during the weekend, but the weather wasn’t working with us. 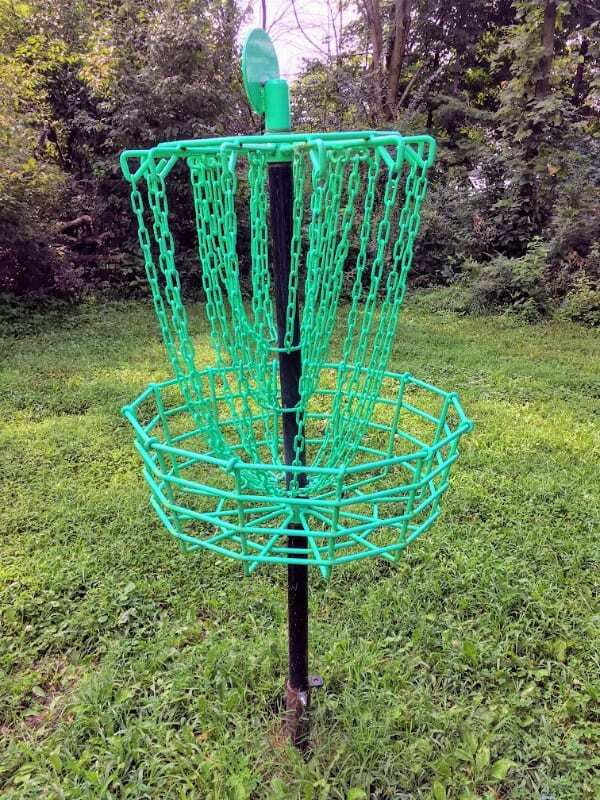 Disc golf is such an affordable and enjoyable sport for individuals, couples or families to play together. 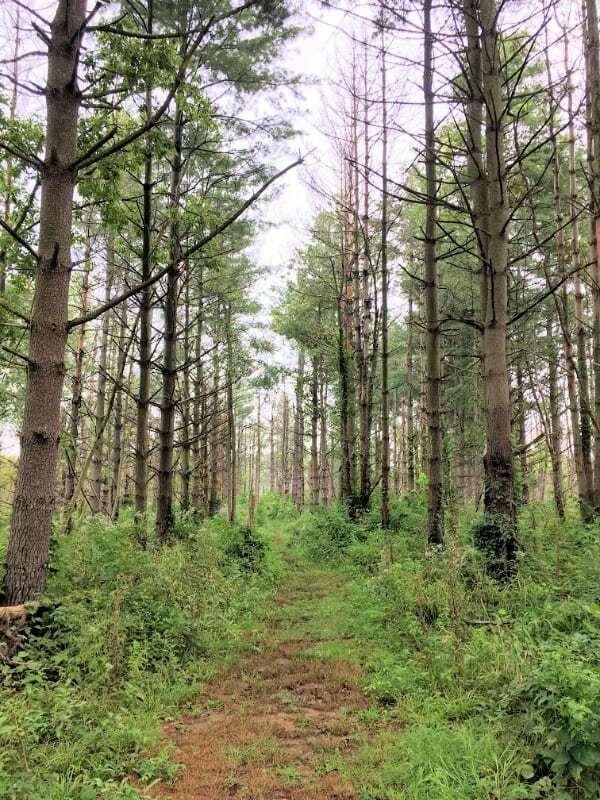 All you need to play is one disc, you can graduate to a full set later, and most disc golf courses are free to play on–of course, since this one is in a state park you would have to pay the gate fee to play. 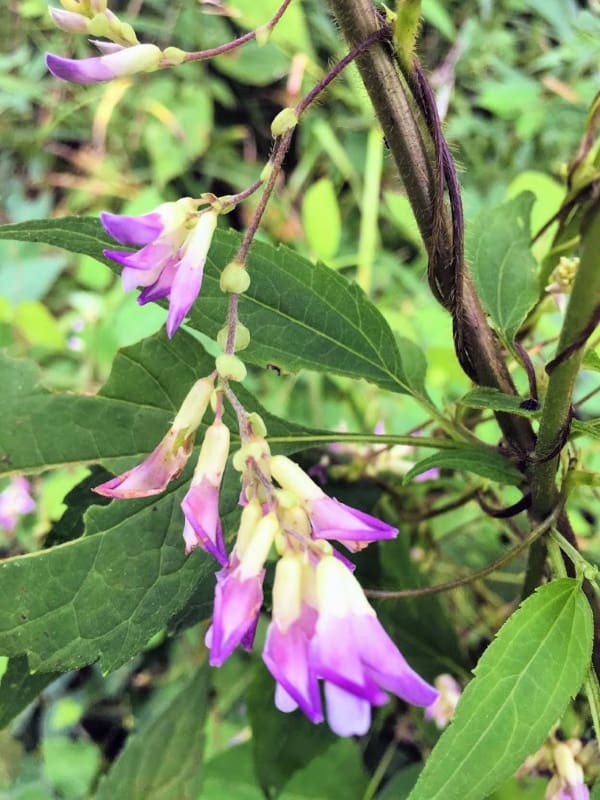 As I wrote earlier, it rained Saturday and after spending a quiet morning in our travel trailer, we decided to head into nearby Peru so that we could explore things that would keep us indoors. 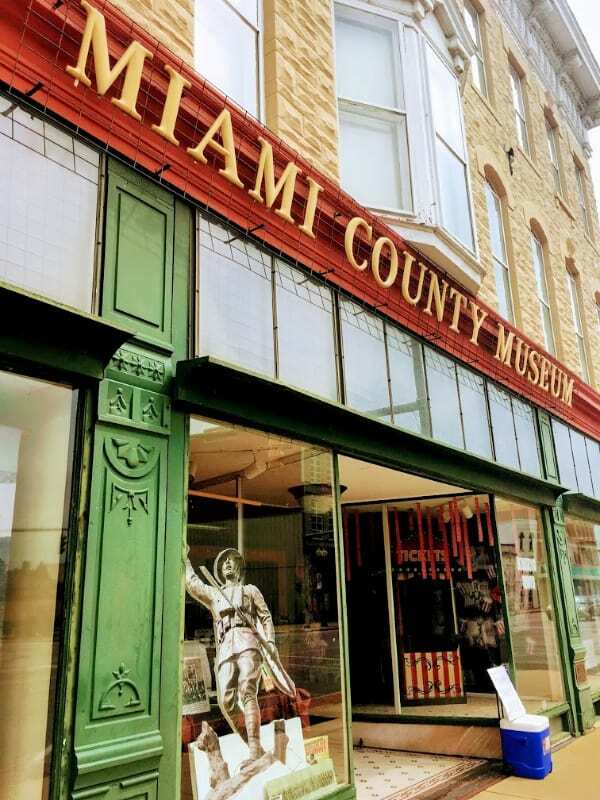 The Miami County Museum is a by donation admission facility and is full of gems for those who have an interest in Indiana history–especially the history of the Miami County area. We took our time wandering all three floors of the museum, taking about an hour or so to completely take in everything available. 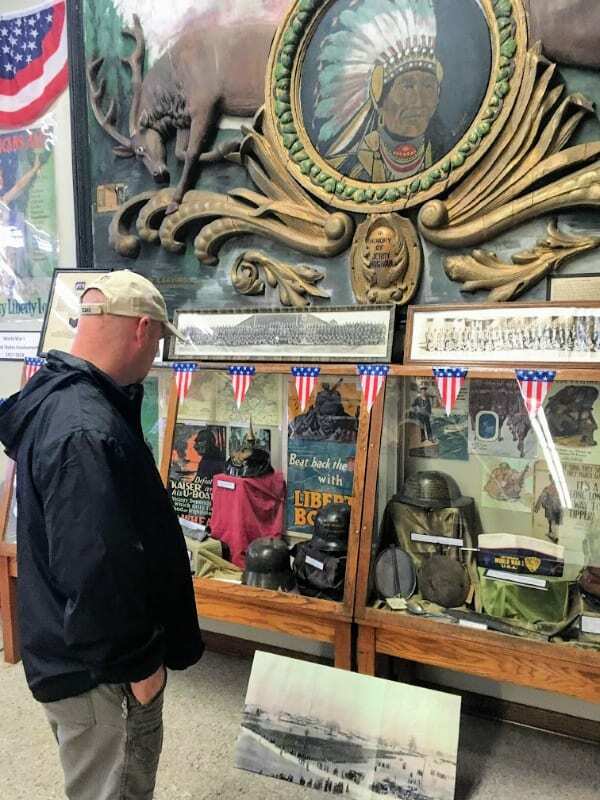 The main floor contains many war artifacts dating from the Civil War all the way up to Desert Storm. 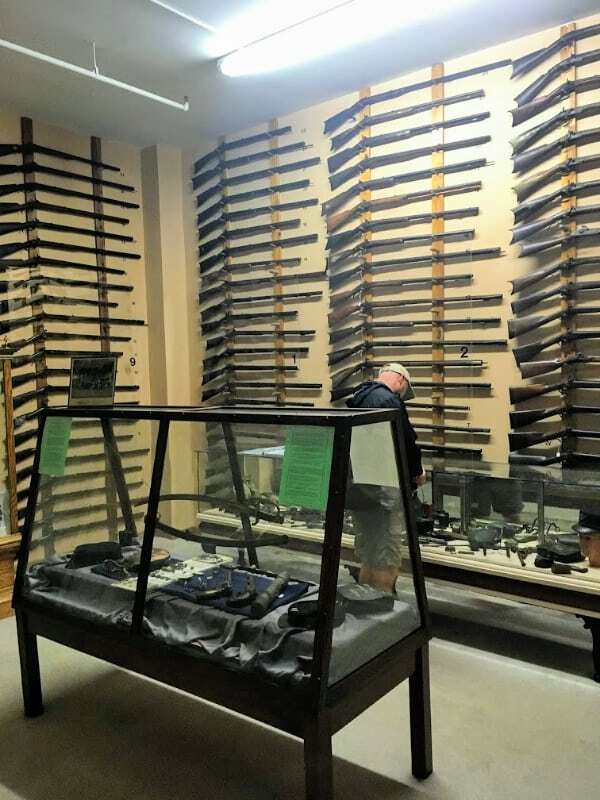 My husband was especially interested in The Walker Armament gallery that held rifles from various periods in history. 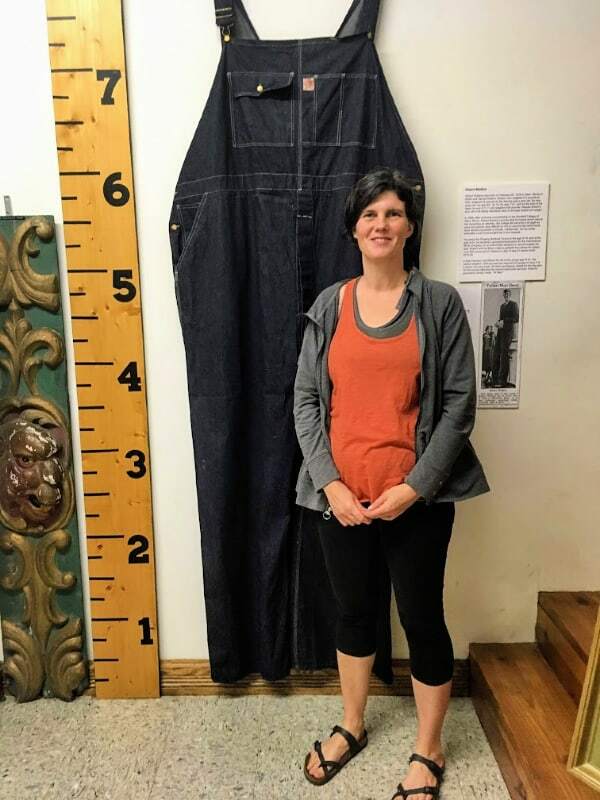 One unique item in the Miami County Museum is Robert Wadlow’s (world’s tallest man) overalls, plus a write-up about him. He grew to the height of 8 feet 11 inches and lived in Alton Illinois. 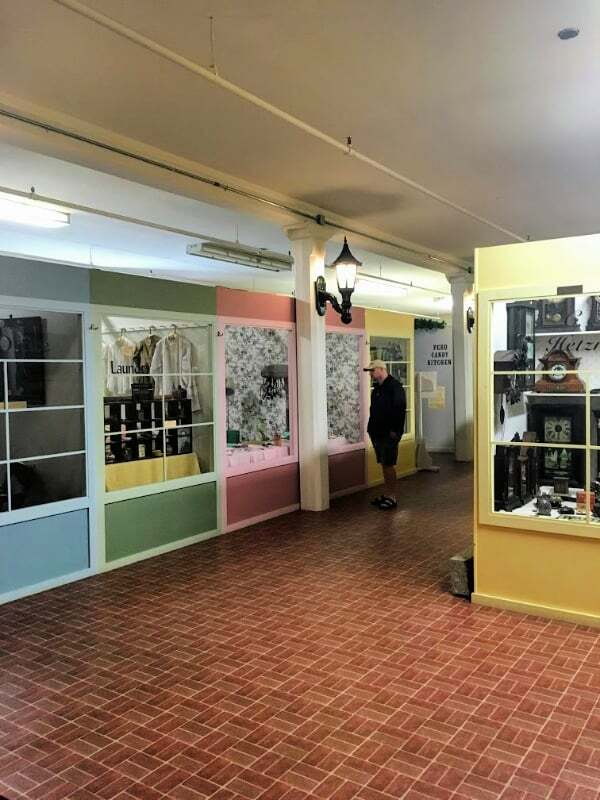 The second floor of the museum contains dozens of storefronts filled with items that would have been in the stores of Peru during the early 1900s. 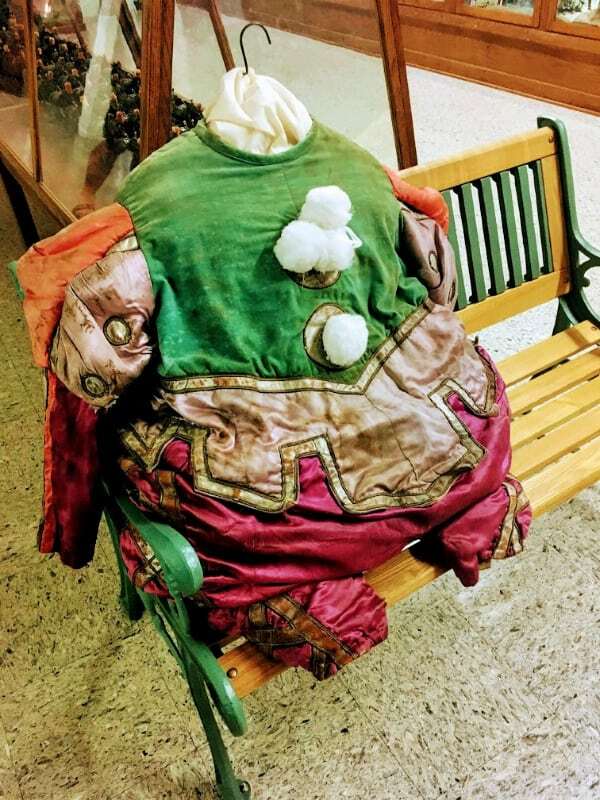 And since Peru, Indiana is known for its circus school with its yearly Circus City Festival it seems only fitting that the third floor of the Miami County Museum is dedicated to the history of the circus. 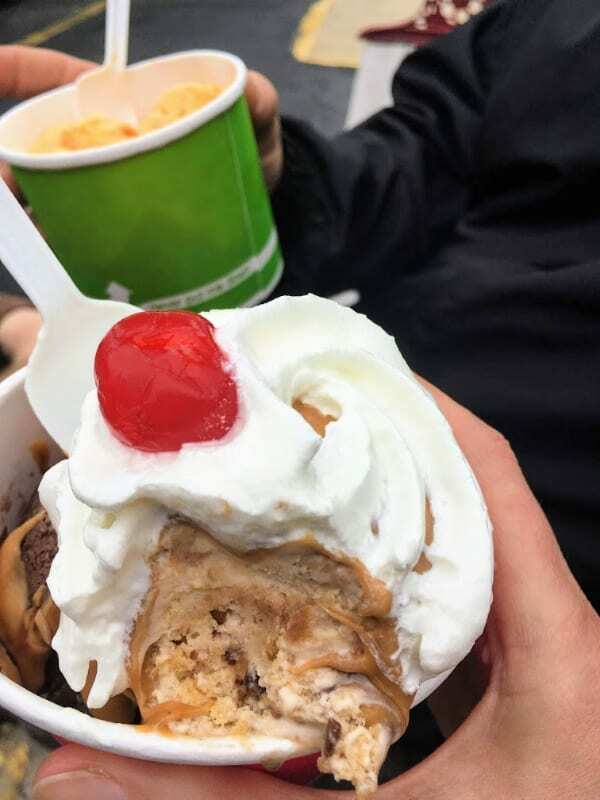 When we came out of the museum, we noticed that although it was still cloudy, the rain had finally stopped, so we decided to try out East End Double Dip Ice Cream shop that came highly recommended to us by a family friend. 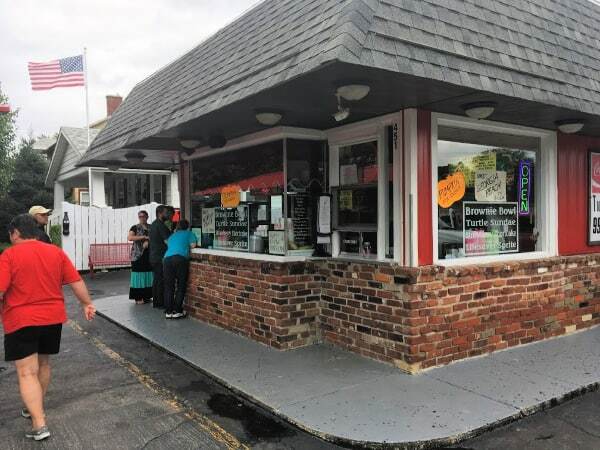 It might look like a fairly plain brick building from the outside, but the ice cream creations served here are definitely not plain. Not only was the ice cream yummy, but the workers were so friendly and helpful. The prices were more than fair and the serving size was generous. However, it is a little hard to find, I recommend entering it into your GPS app if you want to try it out. 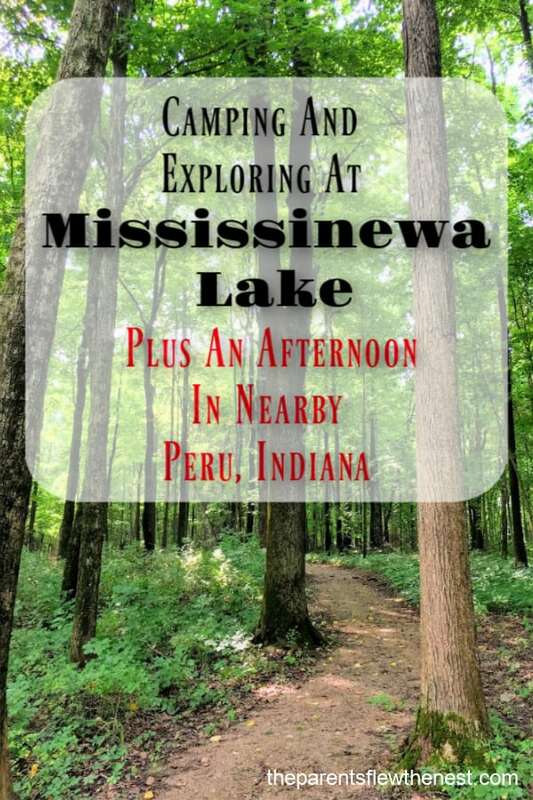 Since we just had two full days in the area to explore we barely scraped the surface of all that is available in Mississinewa Lake State Park and the surrounding area. 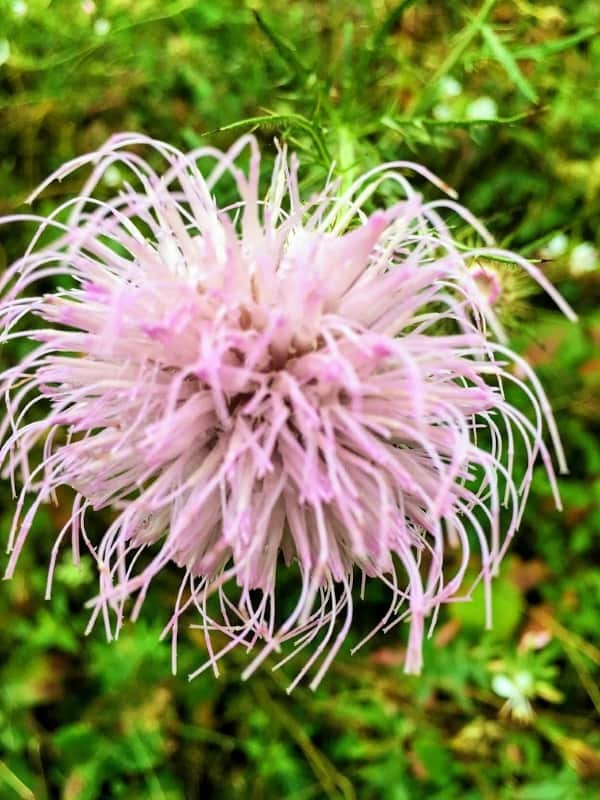 If you should go, here are a few more things you should explore. 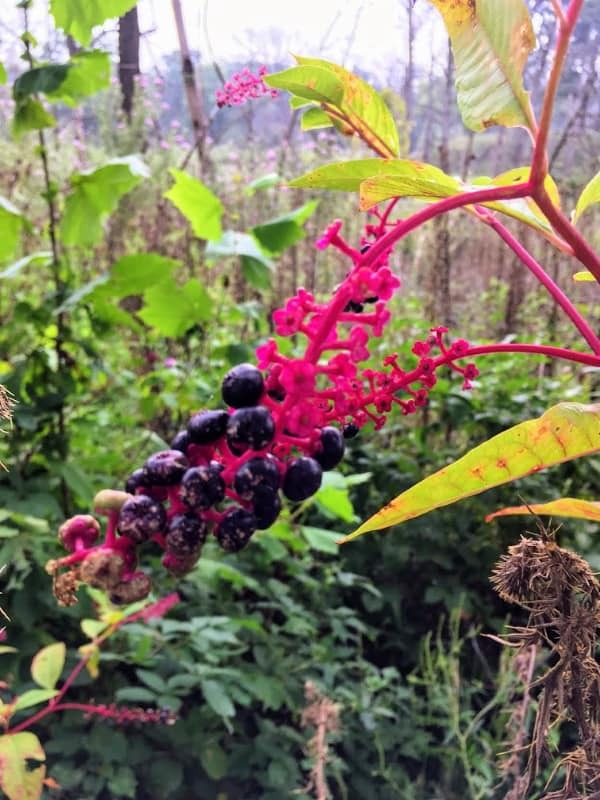 Lost Sisters Trail--Located on the opposite side of the park from where the campground is, this 2.5-mile hiking trail is full history and beauty. Grissom Air Museum–about a 20-minute drive from the campground. We have been before and found it well worth a visit, especially if you like Air Force history. There is a small admission fee, but it is worth every penny you pay. Nickel Plate Trail–again a 20-minute drive from the campground. Great trail for biking, or walking. We like the views from the bridges. McClure’s Orchard–about a 30-minute drive from Mississinewa. 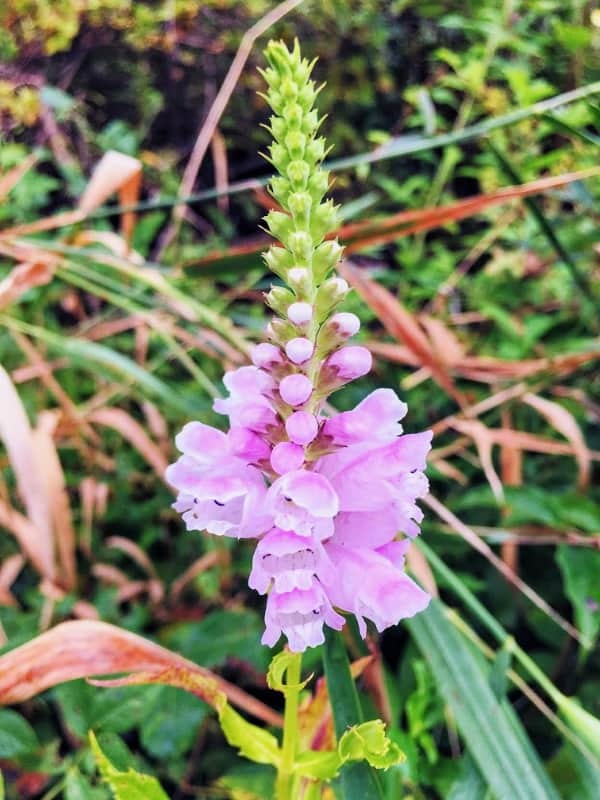 What there is to do depends on the season. American Huey 369 Museum–in the same area as the Grissom Air Museum. Admission is by donation. Circus Hall Of Fame–a 10-minute drive from the campground. Small admission fee. 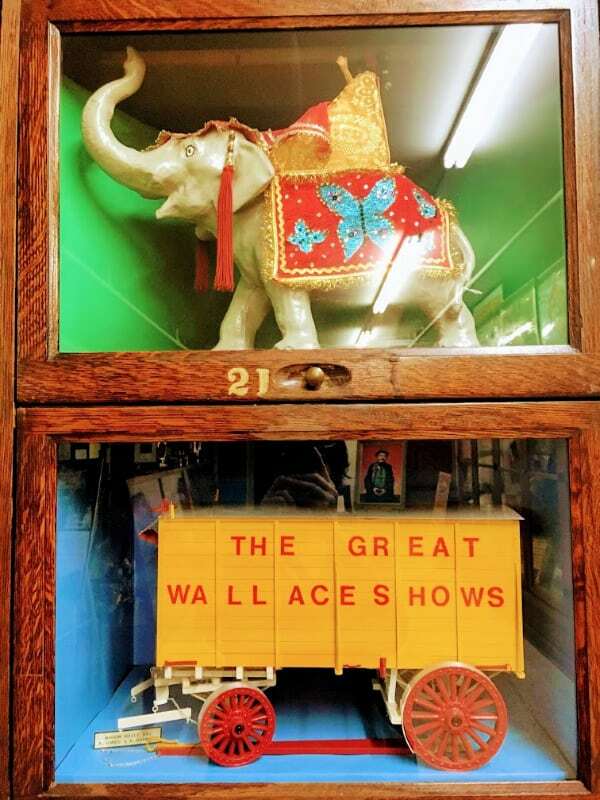 Full of circus memorabilia and history. Want to know how we afford to travel so often? It is because we have developed thrifty living principles that allow us to live a full life for less money. 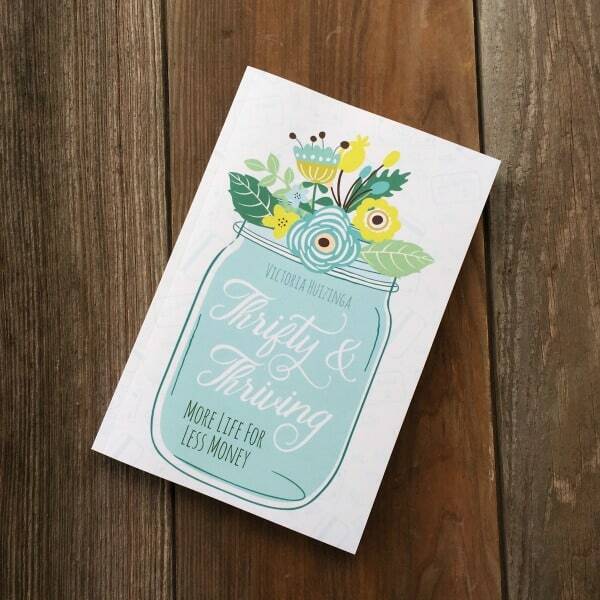 You can learn exactly what those thrifty living principles are when you order and read my book Thrifty & Thriving: More Life For Less Money. You can stop dreaming about travel and start traveling when you apply the 40 thrifty living principles shared in this book.